Coffee Talk Topic: Making Lasting Connections with Your Kids This episode’s coffee talk topic encourages parents to make lasting connections with their kids by being a Read Aloud family! Deuteronomy 6:5-10 (NIV) tells parents to “Love the Lord your God with all your heart and with all your soul and with all your strength. These commandments that I give you today are to be on your hearts. Impress them on your children. Talk about them when you sit at home and when you walk along the road, when you lie down and when you get up. Tie them as symbols on your hands and bind them on your foreheads. Write them on the doorframes of your houses and on your gates." 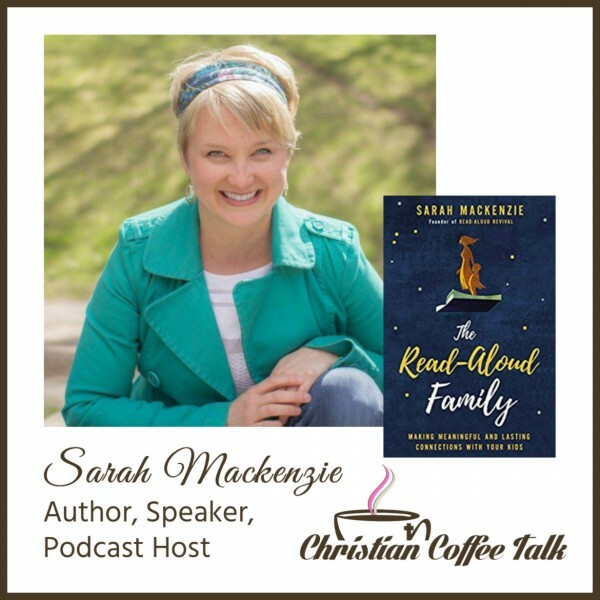 Featured Guest: Sarah Mackenzie Sarah Mackenzie is an author, speaker and podcast host. On the immensely popular Read-Aloud Revival podcast, Sarah helps parents all over the world make meaningful, lasting connections with their kids through books. Sara lives in the Northwest with her husband Andrew, and homeschools their six kids. Mackenzie says "I started writing the book thinking it was sort of a Manifesto on reading aloud. As soon as I started writing it I realize that that's not really what it was about. It was more of a call to connecting with our kids. While I knew that the sharing of stories with our kids is valuable, I realized the most valuable thing was connecting with our kids. I think for so many of us Christian parents, our desire is to really make a deep, heart-to-heart, lasting connections with our children. Stories are a simple and profound way to get there." Host Brandee Nielsen says, "I love how Sarah's book inspires families to get out from behind their smartphones and tablets to read together, which helps make lasting connections. I've heard it said that one of the greatest professions our youth should aspire to early is becoming a chiropractor. All the kids today walk around with their heads down staring into their phones." LINKS FROM THE SHOW Connect with Tina at www.readaloudrevival.com Subscribe to the Christian Coffee Talk Podcast on iTunes Podcast, Google Play Podcast, iHeartRadio, TuneIn, and Stitcher. Join our growing Online Community to connect 24 hours a day, 7 days a week, 365 days a year! Check out our theme song, Jesus Kind Of Love by www.NateJacksonMusic.com.